New Delhi, Aug 5 : The manufacturer of the world's pinnacle super luxury automobiles, today confirmed the development program for a new Rolls-Royce. The new car will reach the market by mid-2016. New Delhi: The Defence Ministry has decided against blacklisting British engine manufacturer Rolls Royce and allowed the armed forces to do business related to essential requirements with the firm, which is facing a CBI probe for allegedly paying commissions and employing middlemen in contracts with state-owned HAL. This follows the Attorney General's opinion which favoured that IAF and the Navy can procure systems essential for their maintenance and operational requirements of the two services, Defence Ministry sources said here. New Delhi, July 9 (ANI-Businesswire India): Rolls-Royce Motor Cars today announced that the company has enjoyed a record half-year in 2014, with sales increasing by 33 per cent worldwide compared with the same period in 2013. Sales growth was seen in all regions, with a particularly strong performance in Europe, up by over 60 per cent, Asia Pacific up by almost 40 per cent and the Middle East up by over 30 per cent. The United States and China also saw double-digit growth. In Europe, strong performance was seen in Germany, with sales doubling. Rolls-Royce has announced its decision to acquire the remaining stake in Tognum from its joint venture partner in order to expand its presence in the market. Rolls-Royce had formed a joint venture with Daimler about three years ago. The company is now spending £1.9 billion to buy out its partner's stake in the 50-50 venture. Analysts have said that Rolls-Royce's earnings will rise five or six per cent. Officials said that the ability to control the entire company will allow the company to gain potential synergies with other part of Rolls-Royce. New Delhi, Feb 18 : Rolls-Royce Motor Cars is delighted to announce the introduction of Ghost V-Specification; a limited series of Ghost and Ghost Extended Wheelbase motor cars, that will be available for customers to commission immediately. "This limited series celebrates one of Ghost's defining characteristics; the exquisite 6.6 litre Rolls-Royce V12 engine," said Torsten Muller-Otvos, Chief Executive, Rolls-Royce Motor Cars. The Serious Fraud Office has said that it has launched an investigation into allegations that defence and aerospace giant Rolls-Royce was involved in bribery and corruption. The regulator has launched a criminal investigation against the company. The moves comes after just a year after the company said that it is holding discussions with the SFO relating to allegations that were made on the internet. The company had said that the investigations were on the initial stages and it was too early to predict the outcome of the investigations. New Delhi, Aug 19 : Super luxury vehicle manufacturer Rolls-Royce Monday launched its four-seater coupé Wraith in India with a starting price of Rs. 4.6 crore. "Today we are proud to reveal the most dynamic and powerful Rolls-Royce ever built," said Herfried Hasenoehrl, general manager for emerging markets-Asia, Rolls-Royce Motor. "Rolls-Royce has enjoyed a great and lengthy history in India, and we're happy to greet our customers here with this exceptional new model." Bangalore, March 15 : A joint venture of the state-run Hindustan Aeronautics Ltd (HAL) and Rolls-Royce of Britain, International Aerospace Manufacturing Ltd (IAML) unveiled its production facility here Friday. Set up with an investment of Rs. 135 crore ($25 million), the 50:50 venture will produce components for the Trent family of aero engines and compressor parts for marine and energy gas turbines. Luxury carmaker, Rolls-Royce has indicated that it might soon offer customised version of its cars for the Indian customers. Britain's Rolls-Royce (RR) has announced that it has appointed Ian Davis, the former head of McKinsey as its new chairman. Davis has worked as chairman and global managing director at McKinsey and also as a non-executive director of BP and Johnson & Johnson. The will now join as the board of as a non-executive director in March. Davis will replace Robertson on 2 May at the Derby-based manufacturer. Luxury car maker, Rolls-Royce Motor Cars has announced the launch of a new model of the iconic luxury car ‘Ghost' model featuring extended wheelbase in the Indian market. The new model offers the best cabin space with the driver dynamic as well as an impressive panoramic sunroof. The new extended wheelbase version ‘Ghost' model will be priced at from Rs. 3.04 crore in the Indian market compared to standard Ghost that came with a starting price of Rs. 2.07 crore. The super-luxury car maker Rolls-Royce is getting aggressive in its approach and with the launch of Ghost, its unit sales target has also gone up substantially. The company is aiming to sell close to 50 units in this year. Sharad Kachalia, Director, Sales and Marketing, Navnit Motors, the authorized Rolls Royce dealer for West and South region, said that the recently launched Rolls Royce Ghost is getting overwhelming response in the country and as it takes close to 2-3 months time for the delivery of the car after the firm order, the company is expecting to sell 50 units this year. 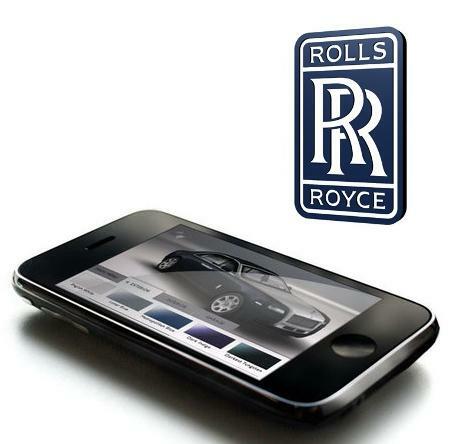 The latest app in the iPhone apart from the Betfair app is the, Rolls Royce app. This new in sink application allows one to configure 'Ghost' all from their devices and see their final designs before actually ordering the car. The app which is ready for download constitutes of various potential designs, colors and customizations to come up with the ideal version for the Ghost (Ghost is the latest addition in the Rolls Royce family of cars after the 'Phantom'). It purchased Norway's automated handling solutions developer ODIM ASA, defense power technologies' company Rolls-Royce said on Monday. It will integrate ODIM's Canadian sensor handling technologies development units Spectrum Ltd. and Brooke Ocean Ltd. units into its naval marine operations in a move to strengthen its market presence, Rolls-Royce has said. It may be debatable that whether relaunching a produce makes sense on the grounds on the stretched brand equity versus the potential to tap higher volumes, but it has been shown in the recent past that the relaunched products have done the trick for the company. Be it the Rolls Royces, Mercs, Hondas or Volkswagens, all the companies have shown that relaunching makes a lot of sense in the automotive world. While the market leader Maruti Suzuki decided to drop the Zen brand from its portfolio last year, the company has recently relaunched the all new WagonR for the Indian consumer. "India is going to be a key market for Ghost and we expect to sell 50-60 units of Ghost in 2010", said Rolls-Royce Motor Car's General Manager for South and East Asia-Pacific, Brenda Pek. That Rolls Royce is banking big time on the Indian market, more so with the number of billionaires in the country ever on the increase, is evident from the fact that the British carmaker's still-to-be-launched super-luxury sedan, the 'Ghost,' was previewed in India on Friday! The most economical of the cars from the well-known maker of the most elite, premium, hand-crafted cars, the Rolls Royce's Ghost will cost Rs 2.5 crore in India. The wholly owned subsidiary of the BMW Group – Rolls-Royce Motor Cars has declared that it is planning to roll out its new global model “Ghost” in the Indian market by the end of this year. The announcement from British manufacturer of luxury automobiles has come right after Tata Motors’ launch of marquee brands Jaguar and Land Rover. Rolls-Royce PLC has announced that it has inked an order worth $1 billion order from aviation major Gulf Air. The order has been signed to supply engines for the Bahrain-based airline’s new Airbus A330 long-haul aircraft. According to sources, British aircraft engine manufacturer will supply Trent 700EP engines to power 20 Airbus A330 aircraft, with deliveries beginning in 2012.